Since 1946, Brown Bros Ford Lincoln has been serving the automotive needs of Vancouver, Richmond, Burnaby, New Westminster, Surrey, North Vancouver, and customers throughout the Lower Mainland, the Fraser Valley and the province of British Columbia. By having the best selection, service and price, our customers have made us the number one selling Ford Lincoln dealer in British Columbia and one of Canada’s top performing dealerships. We define our dealership by the strength of our people who are committed to delivering superior customer satisfaction. We have won Ford of Canada’s prestigious Presidents Award for Customer Satisfaction and Sales multiple times since it’s inception in 2000. Jack Brown’s brother was always going to join him in the business he established in 1946 as Brown Bros. Motors with the purchase of an ESSO gas station at the NE corner of Vancouver’s Granville Street and 41st Avenue. Jack Brown had been a fighter pilot trainer stationed in Winnipeg during the war. Both he and his brother planned to move west. But in the end, only Jack came west. So Brown Bros. Motors was always a bit of an anomaly. There was only one brother involved. The gas station was sandwiched between Cunningham Drugs and the Aristocrat Restaurant, affectionately known as the ‘Crat. Jack Brown was a natural salesman and his business prospered. In 1950, he bought the Aristocrat Restaurant and turned it into a Ford sub dealership where he sold up to 80 cars a year. Many of the cars sold were English built Ford products including Anglia and Consul. By 1952, he was selling five new vehicles a week, up to 250 a year. The business became Brown Bros. Ford, a full franchise Ford dealer. Business increased and 1956 was a year of major expansion when Brown Bros. built a brand new parts and service department across the street on the west side of Granville. The company also opened a collision repair facility on Oak Street. But in 1957, disaster struck with a boiler fire that destroyed most of the original dealership. 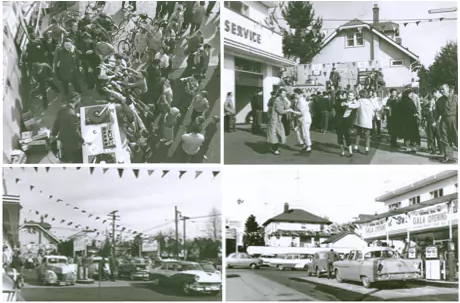 The completely new dealership didn’t open until the spring of 1958 and the Grand Opening celebration was a pure 1950’s dance party complete with hot rods, custom cars, rock and roll and legendary DJ Red Robinson spinning the records on location. As business increased for Brown Bros. Ford, the company bought out another dealership at 40th Avenue and West Boulevard to turn into a new Ford showroom in 1970. That same year, Jack Brown’s son Tom took over management of Brown Bros. Ford. Jack Brown had become a developer building high rise communities including Lougheed Village in Burnaby. The company’s service vehicle was a 1970 Ford Bronco which Brown Bros. Ford has lovingly restored as a tribute to the past. Of all the Ford products that passed through Brown Bros., there is one standout. The company brought in a 1965 Shelby GT350 R code factory race car – one of only 37 built. Brown Bros. campaigned this car through the late 1960’s winning five international championships. The car was subsequently sold for $3,000. Several years ago, the same car sold for $750,000 at a collector car auction. The racing heritage and the business has been carried on by Tim Brown, grandson of the company’s founder. He started in the business pumping gas at the age of 13 and was promoted to an after school lot boy at age 16 when he got a driver’s license. “In those days, people had charge accounts and we would just mark their gas purchases down,” he recalls. Tim Brown drove a really fast Mustang Boss 302 after graduating from UBC with an economics degree and has worked in the business since. He also spent one year in the U.S. at the dealer candidates school operated by the National Automobile Dealers Association (NADA). After 25+ years in the business, Tim Brown still has a love affair with fast cars and track racing. He has two of only five Cobra R Mustangs delivered in Canada in 2001. He has turned one into a 600 horsepower track race car which he maintains himself for competition racing. The second Mustang has been kept in original condition so it can be driven on the street. In 2013, Brown Bros. Ford Lincoln celebrated 67 years in business with a complete rebuild of the expansive SE Marine Drive dealership that opened in December, 1985. This massive facility renovation included turning the existing front showroom into a new modern Ford showroom along with a separate Lincoln showroom and a drive through service department built behind it.